Disclaimer: The comments made here are based on the financial statements for Blackpool Football Club Limited and Blackpool Football Club (Properties) Limited for the year ending 31st May 2016. This article is merely seeking to cover the release of these accounts in a fair and factual manner. Should any party deem any part of the following information to be inaccurate, please contact us on measuredprogress1953@gmail.com and we would be happy to amend any misunderstandings accordingly. The headline figure that will have stood out in recent days is that the club suffered its first loss since before promotion to the Premier League, with an operating loss of almost £1.8m. Following years of unprecedented profits, the gravy train has ground to an almighty halt and with no more parachute payments to fall back on, and only the two year “Riga Revolution” deal fans to count on, the club couldn’t come anywhere near breakeven. Let’s be fair, losses on this scale in League One aren’t unheard of, but at the same time neither are they sustainable in the long term for a club in Blackpool’s current predicament. When the last set of accounts were released, the “cash at bank and in hand” figure for BFC Ltd was close to £9m, but in just 12 months had fallen to £6.8m for the period ending 31st May 2016. Of course, it’s a lot more cash than any other club in the lower leagues not benefiting from Premier League parachute payments would have in reserve, but a 24% drop in the space of a year should be concerning, especially considering there could be further losses to come for the foreseeable future. With a drop in cash of over £2m, it would only take similar losses over the next three years for the well to run dry and what happens at that point is anyone’s guess. “Cash is king” or so goes the phrase and even though the club’s group of companies is operating with a positive net worth, it’s the inability to pay the day-to-day bills which can be a business’ undoing and cash flow should be a concern if this trend were to continue. 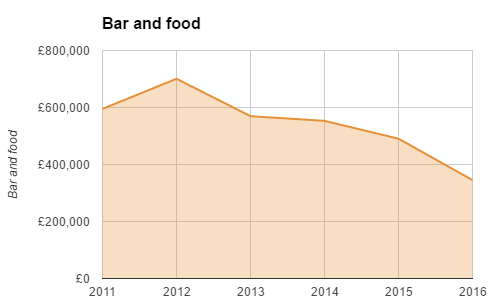 An overall drop in revenue was inevitable, given that this was to be the first season in which the club did not receive parachute payments and had also been relegated from the Championship to League One. 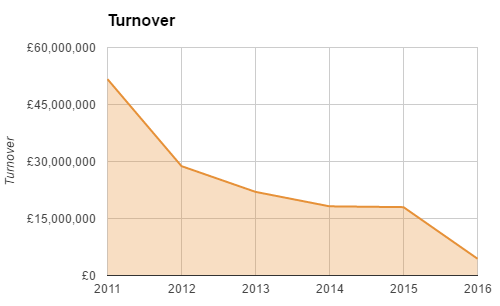 Indeed, the overall turnover (for BFC Ltd) dropped from just under £18m to just over £4.4m, the club’s lowest turnover since 2005/06 (not inflation-adjusted). It’s worth noting that the turnover included in these accounts will include revenue from the 2nd year of the “Riga Revolution” season ticket offer and the total amount of revenue apportioned to season tickets in 2015/16 was £718k, a 43% drop from the 2014/15 season and significantly down from the record high of £3.3m in 2010/11. 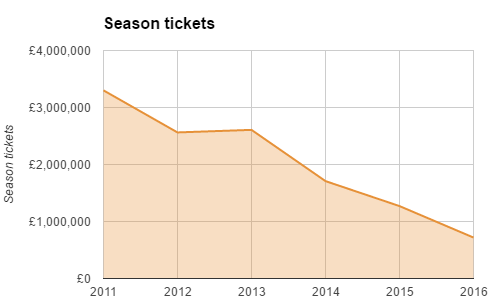 The chart below shows the recent trend in season ticket sales figures. It’s not just season tickets which are falling of course. 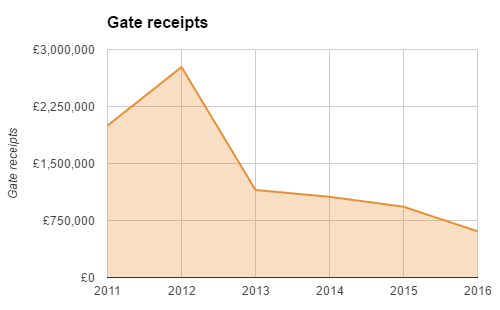 Gate receipts, comprised of individual home tickets, cup games and away fans has also been steadily falling in the last six seasons. Reduced gate receipts will hardly come as a surprise either, compounded by smaller away followings in League One compared to the Championship for the final season of this analysis. Well, what about money brought in from sponsorship deals? 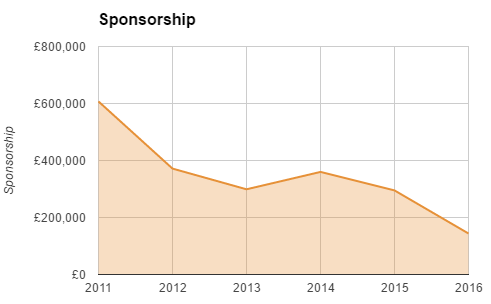 The heady days of being sponsored by everyone’s favourite payday loans company Wonga seem like a long time ago as sponsorship dropped by over 50% following relegation from the Championship. 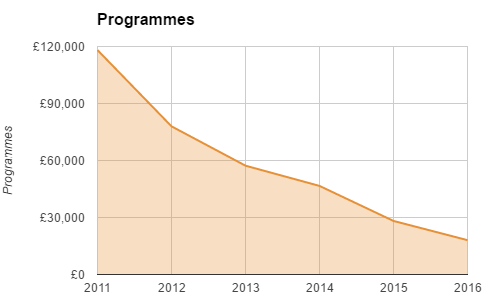 Well, surely people were still buying programmes at least? “Programmes, get yer programmes”! Little known fact about me; I used to be a programme seller at Bloomfield Road back in the glory days of 2000-2004. Cup games against higher league opposition always used to be a nice little top-up on my pocket money and the day the North and West stands opened against Huddersfield was a bit of a money spinner too for us sellers. Then again, there were those horrible wet nights in the middle of winter huddled under the canopy of the old South Stand club shop where you would give up after selling all of about 17 programmes and sneak into the ground with your club pass. With programme sales of just £18k in 2015/16, you have to feel for the modern day sellers when every game must feel like that, especially if they’re still only getting the 10p a programme rate I did back in the day. That pointless diversion into my past out of the way, what about sales from “bar and food” catering? Not quite as dramatic a drop as you might have expected, but still a significant fall of almost 30% year on year. That’s certainly a lot less Lucozade being sold, among other things. If the impact of NAPM has been particularly noticeable anywhere, then it’s the club shop which has been made available for rent. Clearly not the sign of successful part of the business. 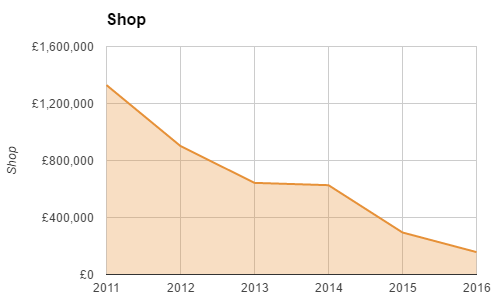 From a high point of £1.3m back in the Premier League season, turnover from the club shop dropped in 2015/16 to a miserable £157k as the number of fans willing to buy club merchandise drastically reduced. It turns out that pinstripes aren’t particularly popular after all. Among the section titled “Strategy and objectives” it stated that the directors are focused on “increasing the company’s turnover through all revenue streams available”. It’s quite clear that the existing revenue streams are not performing all that well, so the club will likely need to find some hitherto untapped potential elsewhere in the business. When you examine the “Key Performance Indicators” section of the accounts, the following sentences are particularly glaring: “The directors (sic) view is that the funds generated by the Club (sic) should be carefully used within defined budgets and strategic plans to protect the future of the Club (sic). 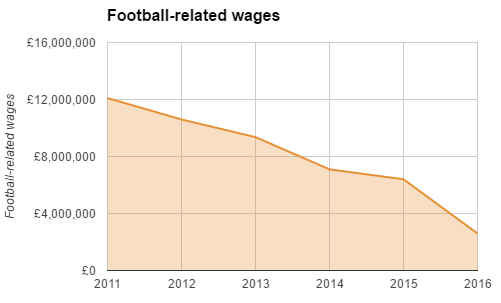 Spend on Players (sic) and Managers (sic) wages in the financial year being reported was £2.6m (2015: £6.4m)”. This represents a massive 60% cut to the playing budget following relegation to League One and a continuing decrease in the wage bill since the Premier League. The saying “you get what you pay for” has rarely been more true and in Neil McDonald and his rabble of a playing staff, the club got exactly what it deserved. With a wage bill almost certainly nearer the lower end of League One than the top, relegation was always a risk and so it transpired as the club was pipped to safety by Fleetwood Town of all clubs. One has to wonder that, assuming the Oyston family have the club’s best interests at heart, which Owen Oyston has repeatedly insisted to be the case, why some of the cash reserves weren’t used to give McDonald a more competitive playing budget. Instead, it could be speculated that the club perhaps thought they might be able to achieve their target (survival) with their chosen budget. If that was the case, then the risk backfired, and with it even fans not fully committed to NAPM may have opted not to renew season tickets due to relegation to League Two. In terms of the various loans that are often discussed whenever Blackpool’s accounts are released, it’s easier to look at them in separate tranches. 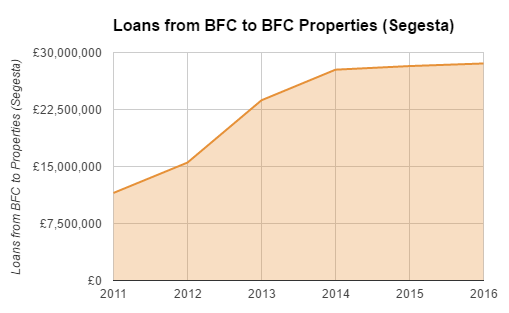 Firstly, we have the loans from BFC Ltd to BFC Properties, which have again increased slightly in this reporting period by around £300k. These loans now total in the region of £28.6m and have been used in the past to fund projects such as ground improvements (East Stand, South East corner), acquisition of the Travelodge land and the purchase of Quernmore Park Hall, among other things. Some of these projects can be more easily understood such as the construction of new stands, whereas the Travelodge land and Quernmore Park Hall are naturally more controversial. How and when the £28.6m will begin to be paid back remains unclear, as the accounts merely state the loan is “unsecured, interest free and repayable on demand”. 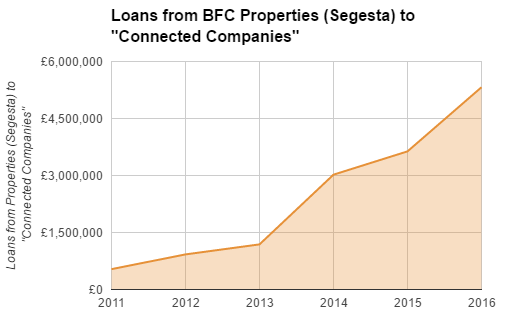 What is perhaps of more interest and is a little more difficult to justify publicly are the amounts which BFC Properties are lending to what are called “connected companies”, defined as companies being under the control of the same people or group of people, i.e. the Oyston family. The chart below shows how these amounts have risen in the course of the last six years. There’s over £5m out there with various Oyston-connected entities that some would argue could currently be put to better use if it was returned to BFC Properties, who could in turn repay £5m of their debt to the football club to be spent on either the team, stadium improvements or even a new training ground of all things. Instead, this money is being used to fund businesses such as: Oystons Estates Ltd, Oystons Ltd, Lancashire Magazine Ltd, Ono Uno (Trading) Ltd and Biomass Boilers Ltd, the latter of which is designated as a manufacturer of gas with Karl Oyston and Victoria Oyston listed as the company’s two directors. Over £700k was also loaned to Zabaxe Ltd, the company which infamously received £11m of the club’s money in the form of director remuneration back in the Premier League season. Seemingly £11m wasn’t enough. An additional curio of the debtors section of the accounts is a £30k loan to J and M Kitching Ltd, which is listed by Companies House as working in the field of “farm animal boarding and care” in Woodplumpton just off the M55. Fans will no doubt question what meaningful benefit projects like this have on a football club in dire need of a change in direction. Most concerning of all, the auditor A I Cherry once again would only sign off the accounts on a qualified basis, stating that they were “unable to obtain sufficient evidence about the recoverability, and hence the carrying amount, of the amounts owed by certain parties, namely Oystons Limited, The Lancashire Magazine Limited, Yorkshire Ridings Limited, Ono Uno (Trading) Limited, Promenade Construction Limited, Promenade Development Limited and Biomass Boilers Limited which remain outstanding”. Conversely, the club’s directors are “confident that all amounts will be repaid in the fullness of time”. That’s a relief, then. Of course, a third type of loan also draws a lot of attention and that is the loan from VB Football Assets Ltd, which was recently in dispute in the courts. As of 31st May, the balanced remained unchanged at almost £7.3m being owed by BFC Properties. The matter is mentioned in the post balance sheet events section, but does not assign any values as the amounts are not finalised yet. The second litigation action between the club’s directors, believed to represent a much more significant amount being claimed by Belokon, is to take place later this summer and this case is mentioned in the BFC Ltd accounts, but again as no material outcome is known at this moment in time, it is stated that “a reasonable estimate of the effect of the petition cannot be made”. It’s safe to say that the whole Belokon situation is a massive unknown, but the financial outcomes of the two cases could set the stage for a different landscape at Bloomfield Road. Quite what that picture will look like will only emerge in the coming months. Away from the courtroom, there is clearly significant work to be done for the club to turn itself around if no change of ownership is forthcoming. Indeed, many would argue it’s impossible without that. Nonetheless, returning to the “Strategy and objectives” section on the opening pages of the financial statements, the club makes clear that “the directors will be focused on achieving promotion back to League 1 (sic) and the Championship”. No mention of a return to the Premier League, one will note. Recent form on-the-pitch has propelled Gary Bowyer’s team into a play-off position and as we enter the final weeks of the season it’s not inconceivable that the club could meet the first of its objectives despite the chaos of the last few years. Quite what that would mean in increased revenue (TV deals and prize money aside) is unclear, with the NAPM boycott unlikely to be broken wide open with a promotion, even if a couple of hundred do return. For the most part fans’ resolve appears steadfast. The stated goal of returning to the Championship would appear a little more difficult, especially with the stated caveat in the objectives that the club will be focused on “identifying talented players and securing these players on contracts within financial parameters”. It does generally take a larger playing budget to get out of League One compared to League Two, and if the crowds don’t return, it’s hard to see how the club can achieve that aim without incurring an even bigger loss than the £1.8m one featured in this reporting period. Is such a challenge sustainable without significant additional revenue from somewhere? There is also the small matter of the amounts the club could be losing this current season. It’s hard to speculate too much about what the potential (assumed) loss might be given there are so many factors, but one would have to imagine that all of the various streams such as season tickets, gate receipts, sponsorship, catering, programmes and merchandise will have fallen with divisional status. The next set of accounts could be an even more sobering read. Comments will not be switched on for this post. Thanks for your understanding.